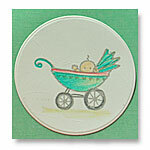 Make your own baby greeting cards! Yes, instead of ordering those so expensive baby shower invitations, thank you notes, and birth announcements, why not create them yourself. You could also make it a special event by inviting some friends or family members over one afternoon to help you create these baby cards. I'm sure they will thoroughly enjoy this meaningful time in preparation for the new born child. You could take some pictures and make a baby journal. What a creative memory! You and your child will treasure it for life. So get ready all your card making supplies and gather your friends. Design and create your words for the baby announcement cards on your computer. Samples Of Homemade New Baby Greeting Cards. Note: You can print texts for your cards using decorative fonts on your computer. You can use Microsoft Word for this task. Print them out on white, cream or soft pastel colour card-stocks. Trim with your decorative scissors and layer over soft pastel colour designer card stocks. Then embellished with cute buttons, ribbons, eyelets, tags or any baby stuff. Be creative! 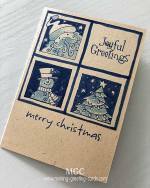 Use rubber stamps or use your own doodle arts, etc. Anything fun, cute and sweet. Yes and most of all have fun in the whole process. Choose a photo of your new born baby and develop more prints. Make Baby Photo Cards. Make a print of your baby's hand, scan it into your computer and resize to a good size for your card design. You could scan your baby's hand directly into the computer. Use 12" x 12" scrapbooking paper. There are lots of lovely pattern paper which you cut to card size. A piece of this scrapbooking paper can make two 6" x 6" square cards. Knit mini baby booties and glue to the front for your card. Use stickers - there are even 3D stickers that you can peel and stick onto the blank cards. 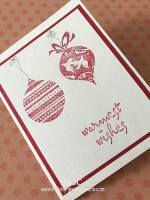 These are especially convenient and quick to use for card making. The above are just some ideas that you can use to create beautiful baby invites. Use your creativity and I'm sure you will think of more ways to make your invites, announcements and thank you cards personal and exciting to receive. 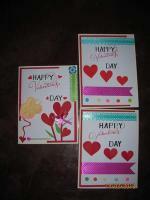 Don't forget printing out or hand writting a verse or words for your baby cards. Here are some baby greeting card verses that might be helpful to you. Choose any one of them for your card. Print it out on a piece of writing paper to insert inside your baby greeting cards. 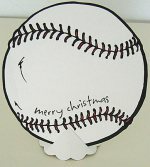 Or hand print them right inside the card. click here to read the card verses. Check out some birthday cards for kids here.